If we can be of any assistance to you or if you have any questions regarding our capabilities please e-mail us with your company name, contact name, phone or e-mail address with a description of any processing need you may have. We will respond to any questions or requests immediately. 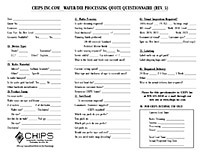 If you have an immediate processing need that we can be of assistance with please download our RFQ form and either e-mail or fax it back to us. Download our full RFQ form in Adobe PDF format. Click on the link below to Adobe to download the latest version of Adobe Acrobat Reader.